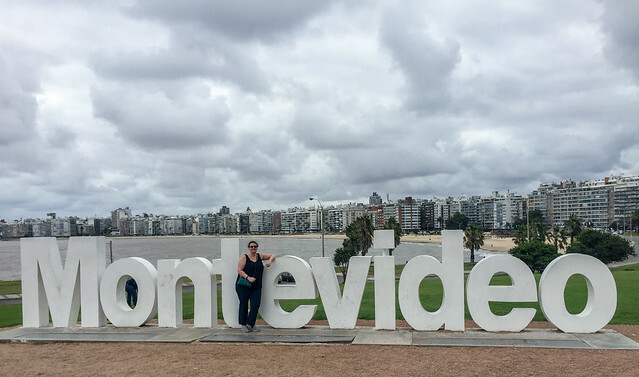 In January I joined the ship Norwegian Sun in Chile and over the following 6 months I travelled over 11,000 miles of places I've never seen before. I've been working on cruise ships almost 7 years and this was the dream contract, it's unlikely I'll get to see so much in such a short space of time again. To share some of my experience with you I'm dividing my photos into categories so let's begin with cities. Before even joining the Sun I arrived into Santiago, capital of Chile, found my friend Glen and explored! It's a very interesting and historical city and clearly very beautiful. 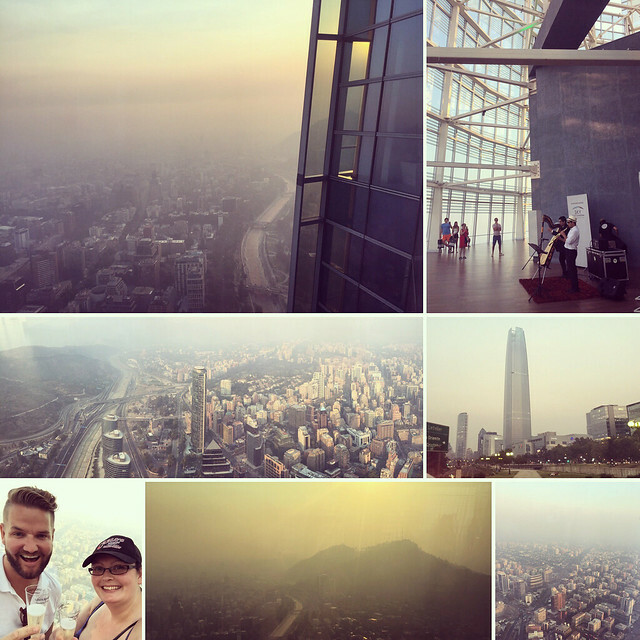 I had seen the Andes as I flew in however serious forest fires prevented us from really experiencing the view from Gran Torre... I'll just have to go back one day. I'll also have to go back to Valparaiso because although we drove through to join the ship I was never able to explore on foot due to strike action at the port on our return. 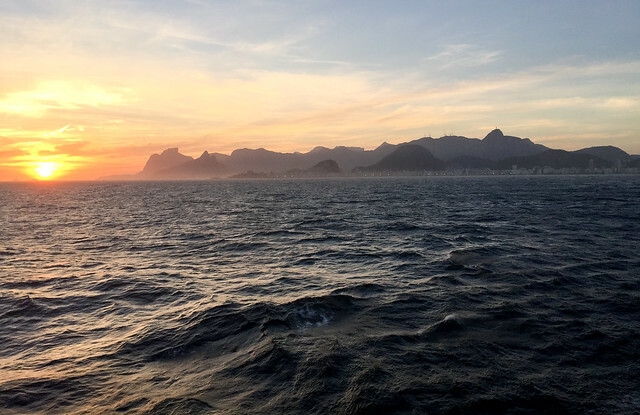 The cruises that I did went down Chile, up Argentina, past Uruguay and onto Brazil and back round again a few times before we then carried on up the Pacific coastline and ended up in Alaska. For this blog posting I'm going to start at the Atlantic coast as it went from Brazil all the way down, round and up to Alaska. I'm completely in love with Rio. We were fortunate to have plenty of time to explore. Here are the views (and crowds) at Christ the Redeemer. You can see Sugarloaf Mountain sticking up in the distance, I went up there twice because the view was just stunning! You can see Christ the Redeemer lit up on the highest peak. Because we're crazy (!) 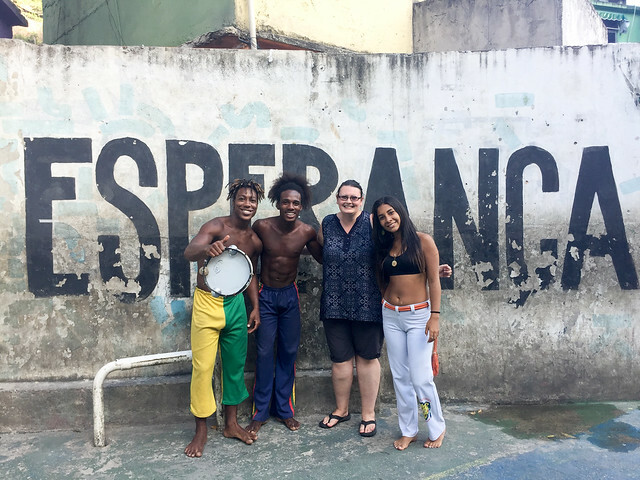 we took a tour of a favela (the slums) that are so famous in Rio, a city of contrasts. 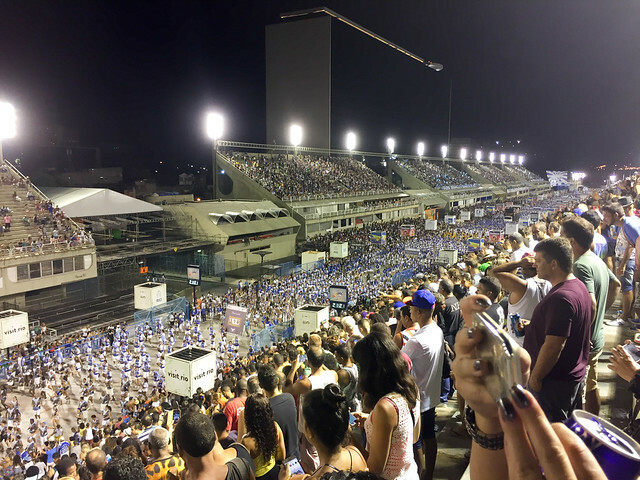 We did so much in Rio, the botanical gardens, eating at an amazing churrascaria and although we weren't there for the week of carnaval (carnival) we were overnight for the rehearsals so I experienced this at the Sambadrome and for free! 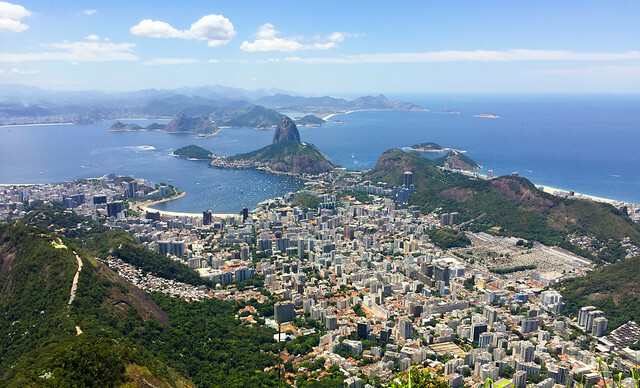 For me Rio is so special and unique. Here's my sunset sailaway with the city skyline that's not skyscrapers but mountains. We actually had many stops in Brazil, there are many beach locations! But here's a couple of views of Santos, a coastal city in the Sao Paulo state, one of the largest populations in the world, famous for its long gardens running parallel to the beach. Heading south of Brazil you come to Uruguay, a much smaller country than those around it, it does not suffer with the same extremes of poverty. 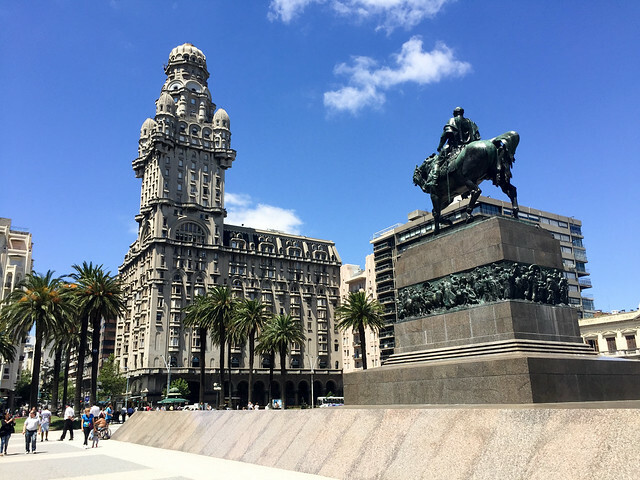 Montevideo is the capital. 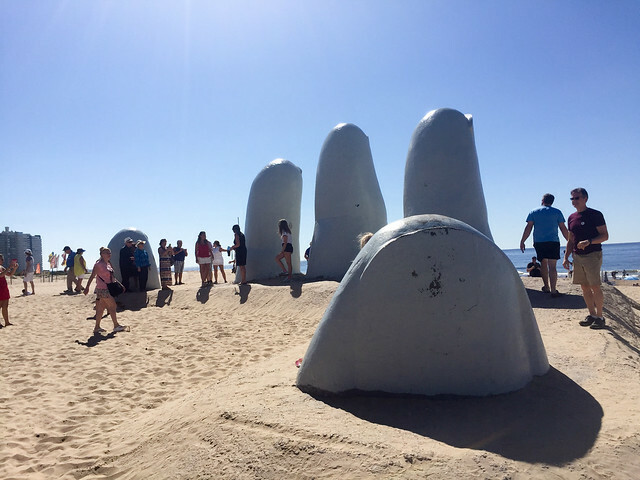 It has an old historical centre and then out of town we also stopped at Punta del Este, full of small boats and posh cafes it is famous for it's artists and art including this giant hand on the beach. 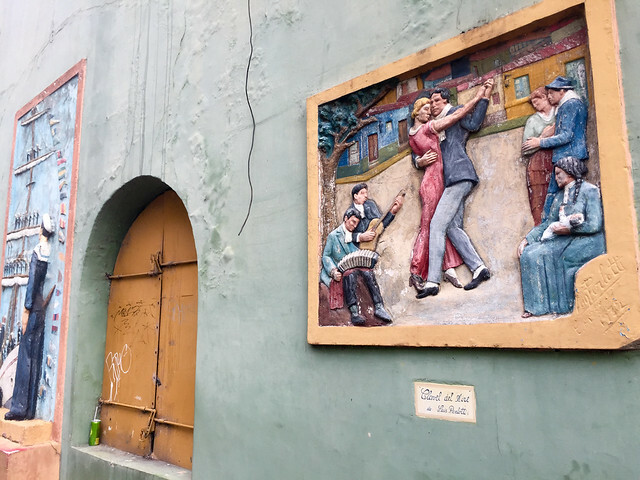 This is La Boca and Caminito where the music for Tango was inspired. 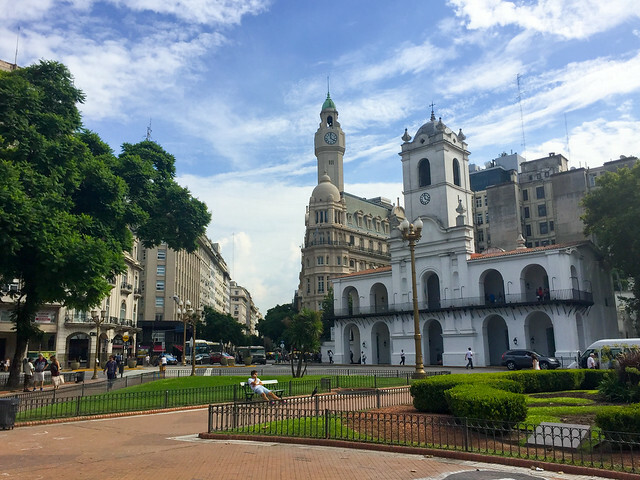 Buenos Aries is another city of contrasts with La Boca still being the poorer area but the centre of town is overwhelmed by old European style buildings, we were even able to go for a very posh afternoon tea, then along the waterfront are the newer, modern city areas. The main square and the pink building where Evita did her famous speech from the balcony. 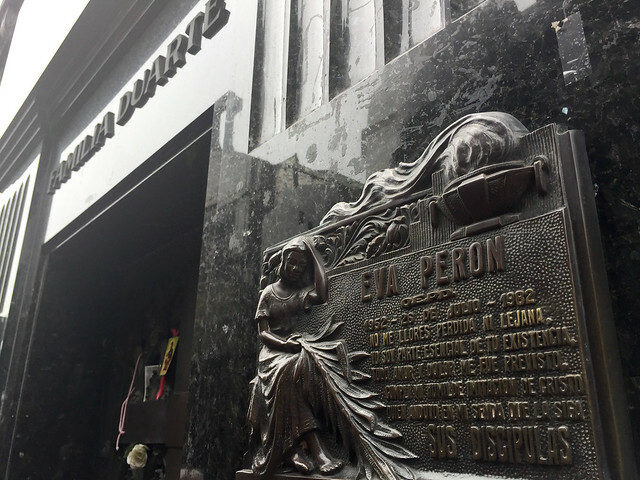 And her much visited grave. The shape of this bridge in the new part of town is inspired by the movement of the Tango. 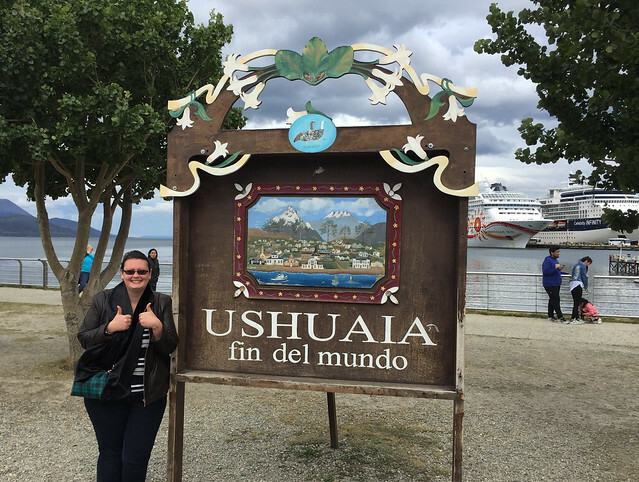 Almost 1500 miles away from Buenos Aries but still in Argentina, Ushuaia is where you come to take a trip to Antartica (about another 3 days sailing south). 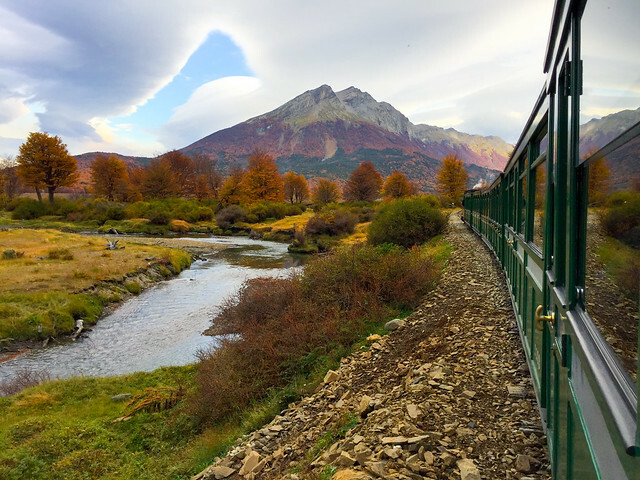 You can also take a trip on the stunning train at the end of the world. 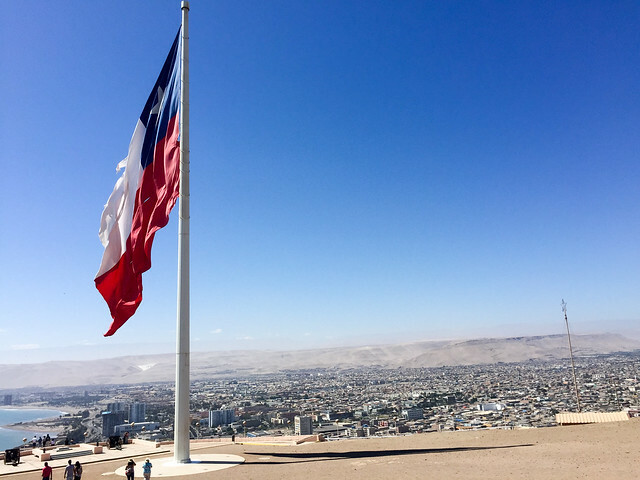 So, heading back up, round through the Chilean Fjords and Chilean Lake District (beautiful) I didn't really stop anywhere you could call a city until Arica, the northernmost city in Chile. Only 10 miles from the border of Peru beyond those mountains you're looking at the way to Machu Picchu. 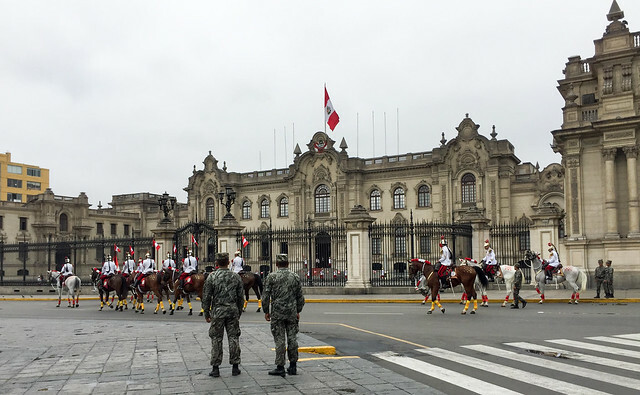 In Peru we went to the capital city of Lima and got to see the changing of the guard. 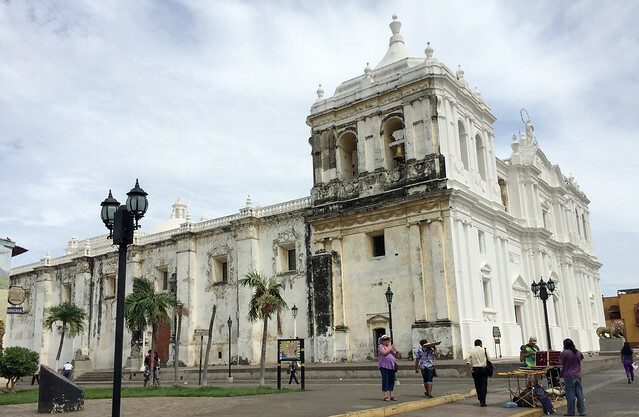 More north and in Nicaragua we visited the second largest city in the country, Leon. 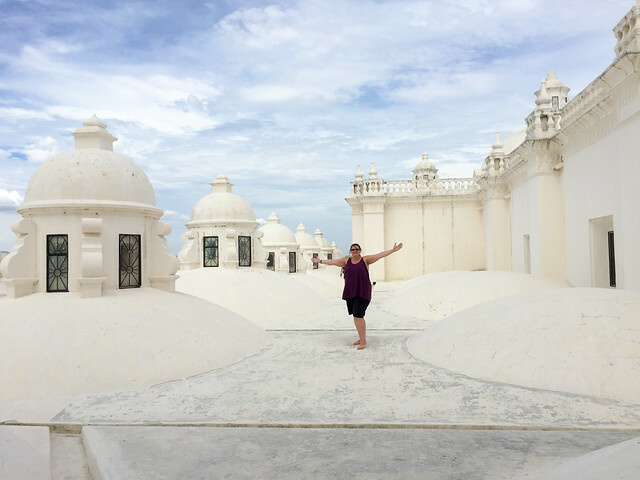 The thing to do here is walk on the roof of the cathedral! 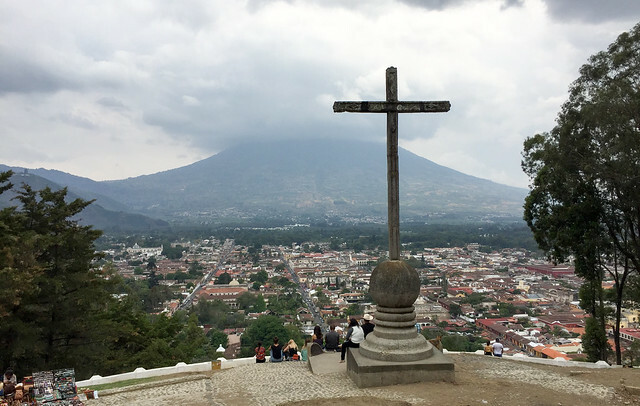 Looking out at the volcanos in the distance. 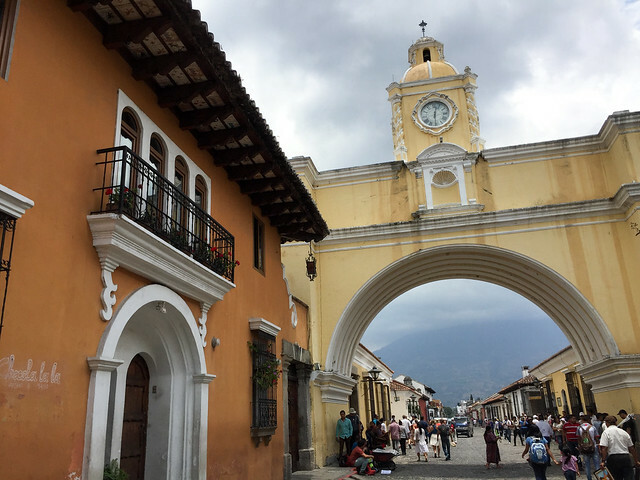 Next up Guatemala and I visited the historical city of Antigua famous for it's Spanish colonial buildings. And finally after a bit of Mexico (beaches, not cities) and the U.S. we arrived into Vancouver, our home port for taking guests on Alaska cruises. I wish this view called "the Lookout" didn't have these strange windows, however you can still see city and mountains, it is beautiful. I took a trip to the famous Capilano Suspension Bridge in a beautiful park area in the mountains. After this was Alaska, Juneau being the capital and Anchorage, the largest city but the experiences I had here don't relate to them being cities and will follow in a future post. 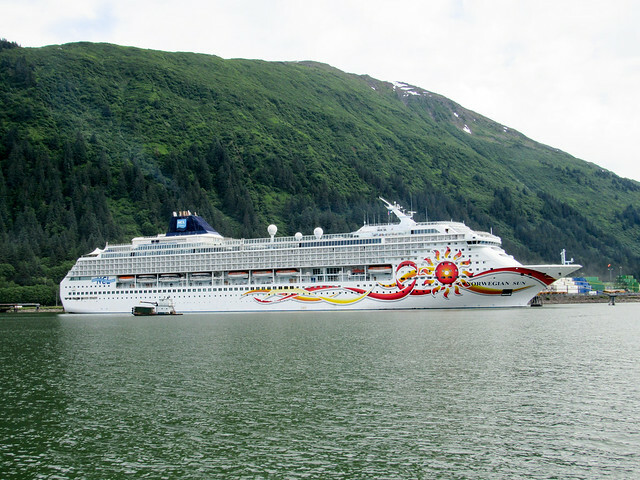 But I will finish with a picture of Norwegian Sun in Juneau, capital city of Alaska.